Two weeks ago I wrote in the space about our trip to Sedona and the best restaurant in town, the Elote Café. Last week I wrote about my version one of the better dishes we tried there, the dish for which the place is named: elotes (sweet corn). But the best dish we had at the restaurant was their uchepos, Michoacan style fresh corn tamales served with queso fresco, roasted tomato chipotle sauce and sour cream. The thing that made the dish was the pillowy texture of the masa used in those tamales. When I’ve made tamales in the past I have, invariably, been disappointed with the texture of the masa itself. It comes out tasting richly of the maize itself, yes, but also comes out with the texture of the red sandstone for which Sedona is so justly famous. Not so Elote Café’s uchepos. I was determined to figure out why. The trick, it seems, is baking powder. Combining baking powder with good manteca (pork lard) yields a soft, light and pillowy texture that is luxurious, special and makes all the work involved in making tamales well worth the effort. For my tamales, though, I wanted more than corn in the filling. Corn and poblano are a classic combination and pork and poblano have a natural affinity. The three together are gold. Prepare the cornhusks. Submerge the husks in hot water, weighted with a plate to keep them under water, and let stand for at least an until they are pliable. Dry the husks with a towel. Separate out 28 of the largest and most pliable husks—ones that are at least 4 inches across on the wider end and 6 to 7 inches long. If you can’t find enough good ones, combine some of the large ones (overlapping them) to give wide surfaces upon which to spread the batter and then the filling. Prepare the batter. Add the masa harina and water to the bowl of a Kitchen Aid or similar mixer and beat until the masa is reconstituted. Remove from the mixer. Combine the lard, two teaspoons of salt and the baking powder in the bowl of the mixer and beat until light in texture, about 1 minute. Add in the reconstituted in three additions. Reduce the speed to medium-low and add 1 cup of the broth. Continue beating for another minute or so, until a ½ teaspoon dollop of the batter floats in a cup of cold water. Beat in enough of the remaining ½ cup of broth to give the mixture the consistency of soft (not runny) cake batter; it should hold its shape in a spoon. Refrigerate the tamale batter for an hour (but rebeat, adding a little more broth or water to bring the mixture to the soft consistency it had before refrigerating). Make the Salsa. Preheat the oven to 350° Fahrenheit. Line a hotel pan with aluminum foil lightly oiled using the olive oil. Place the tomatoes, chiles, onions and head of garlic on the pan and roast for half an hour, removing the ingredients as they are fully roasted. The chile peppers will be the first done (about 15 minutes), followed by the onion and garlic. As the ingredients are cooked (removing the cloves of garlic from their paper), add them to the bowl of a Vitamix or other high-speed blender (or a food processor). Season with salt and the juice of one lime. Process to a smooth puree, adding additional salt or lime juice to taste. Make the Filling. Cut the pork into a ¼ inch dice and season with salt. Sauté the pork in the olive oil for two to three minutes until lightly colored, add in the onion and poblano chiles and cook for another two to three minutes. Add in the red wine and bring to a boil. Lower the heat and simmer until the wine is nearly evaporated. Add in the corn and reseason. Cook for two to three minutes and taste, adjusting the seasoning. Ready the Steamer. 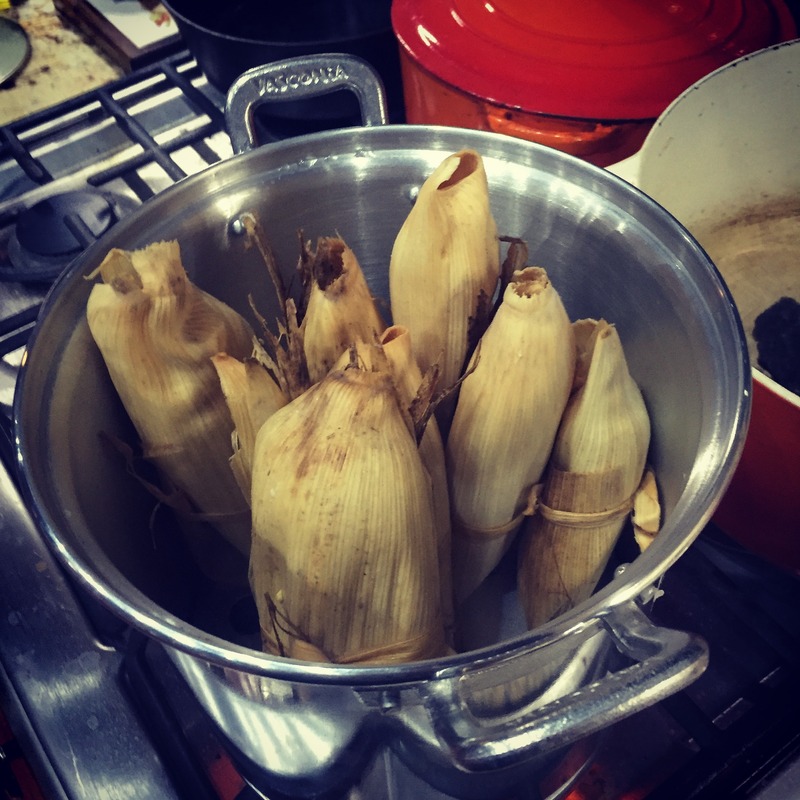 Using a large, nearly kettle-size tamal steamer available in latin markets, line the top of the steamer in left over cornhusks to protect the tamales from direct contact with the steam and to add more flavor. Make sure to leave tiny spaces between the husks so condensing steam can drain off. Form the tamales. Cut twenty-six 8- to 10-inch pieces of string or thin strips of cornhusks. One at a time, form the tamales. Start by out one of your chosen cornhusks with the tapering end toward you. Spread about ¼ cup of the batter into about a 4-inch square, leaving at least a 1 ½ inch border on the side toward you and a ¾ inch border along the other sides (with large husks, the borders will be much bigger). Spoon about 1 ½ tablespoons of the filling down the center of the batter. Pick up the two long sides of the cornhusk and bring them to surround the filling. If the uncovered borders of the two long sides you’re holding are narrow, tuck one side under the other; if wide, roll both sides in the same direction around the tamale. If necessary, wrap the entire package in a second husk. Fold up the empty of the husk to form a tightly closed “bottom” leaving the top open, and secure it in place by loosely tying one of the strings or strips of husk around the tamale. As they’re made, place the tamales in the steamer, standing them on their folded bottoms in the prepared steamer. Leave room around the tamales to expand. Steam the Tamales. When all the tamales are in the steamer, cover them with a layer of leftover cornhusks. Set the lid in place and steam over a medium heat for about 1 hour. Watch carefully to be sure that all the water doesn’t boil away and, to keep the steam steady. Pour boiling water into the pot when more is necessary. 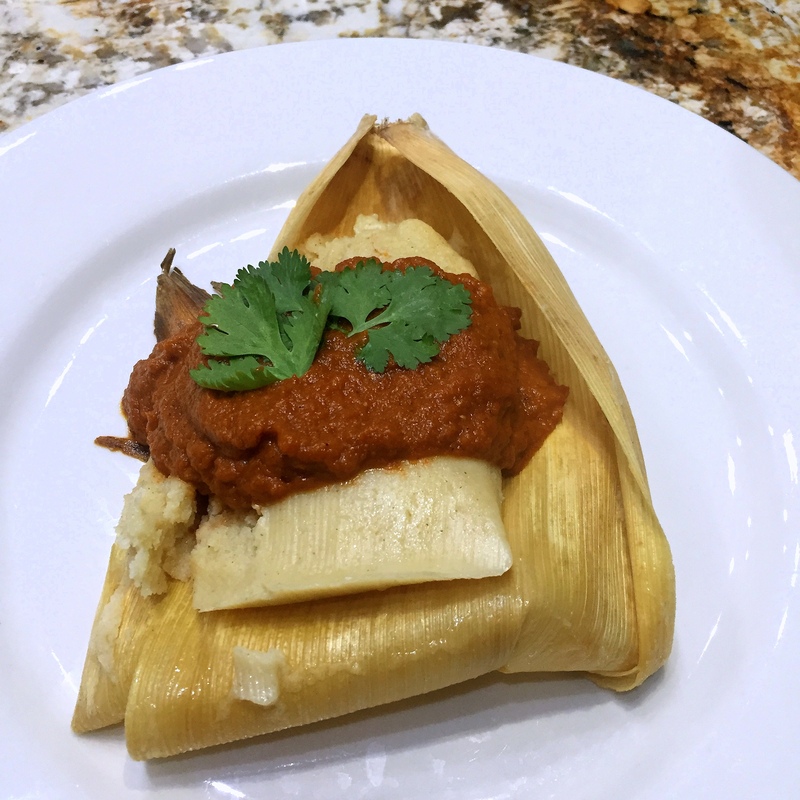 Tamales are done when the husk peels away from the masa easily. Let tamales stand in the steamer off the heat for a few minutes to firm up. Present the Dish. Untie the tamales and take the folded bottom portion of the husk and roll it under the tamale on the plate. Ladle the sauce over the tamale and garnish with cilantro leaves.